For this month's "Maps of the Month" featurette, I wish to draw your attention to our Mega Man Solid X: Guns Of The Mavericks (J) (GBA) maps. Capcom is no stranger to cross-overs. There are several games where the title itself makes the cross-overs very evident, such as Marvel Vs. Capcom (and its sequel), Capcom Vs. SNK (and its sequel), SNK Vs. Capcom: SVC Chaos, SNK Vs. Capcom: Card Fighter's Clash (the two Neo-Geo Pocket Color games), and the Japanese game Namco X Capcom. Prior to Marvel Vs. Capcom, their Street Fighter series have also seen cross-overs with X-Men and other Marvel heroes, but the Mega Man series has its share as well, all with Konami. Capcom's Mega Man Battle Network 5 can be linked to Konami's Boktai 2: Solar Boy Django for a strange cross-over involving Shade Man - and who can forget Mega Man and Simon Belmont (of Konami's Castlevania) teaming up on Captain N: The Game Master? Capcom's Mega Man (X) crosses over with a Konami property again here in Mega Man Solid X: Guns Of The Mavericks. The story is essentially a simplified version of Metal Gear Solid's, with Mega Man X in place of Solid Snake. The gameplay (much to the chagrin of MGS fans) is more closer to the Mega Man X series' blast-them-ups than MGS's stealthiness. The bosses are Capcom's take on MGS's FOXHOUND unit, if they were Maverick Reploids. After all, they share the same style of names (they're all named as "[descriptor] [animal]"), and this was probably the inspiration to even try to mix these two completely different games. 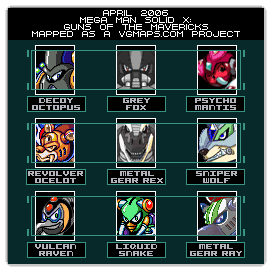 So to recognize the team effort in making these maps, JonLeung's, bustin98's, Osrevad's, Grizzly's, and Revned's Mega Man Solid X: Guns Of The Mavericks maps will be known as VGMaps.com's Maps of the Month for April 2006. It's a shame...a real damn shame...that the forums had a "reboot" in April. So for those of you who didn't get it, this is an April Fool's joke. Since many stages were based on chunks/palette swaps of existing stages from the Super NES Mega Man X games, credit is also due to Revned and Geminiman for mapping those games. Geminiman in particular submitted a lot of maps during the project. I really had a lot of fun doing the sprite edits (a keen eye would notice which Mavericks were used, and that there is at least one from each of the first 6 Mega Man X games), but I really love bustin98's work. He understood what my concept was from the get-go. The deadline was kind of tight (we literally finished this on the evening of March 31st), so future projects with a deadline we'll start a lot earlier. It's a sad fact that the topic that showed the progression of this project was lost, but I believe it was two months of work, greatly accelerated in the last two weeks of March. I'd kind of hoped it would've received more attention, but in the end it turned out better looking than I'd imagined, so it was worth it. I'd like the other mappers to chime in on how they felt the project was, and what everybody else thought of it. Okay, if it works, please post about your involvement in it. While it's still...April. For me, this project presented an interesting challenge of dropping my natural artistic tendencies and create drawings based on a particular style. Though I can be particularly critical of my work, I feel satisfied that the characters turned out how I envisioned them. I'm amazed by the mapping techniques you guys use and its cool to see so much talent brought together in such an interesting way.